A month ago we were wondering if we’d even get to see our Ducks put on their Dancing shoes at all. Now we’ve got a chance to see them go deep into March and show off those Cinderella slippers to the whole world. The NCAA’s West bracket opened up in a startlingly weak way yesterday, with 4th-seeded North Carolina and 5th-seeded Arkansas winning their round of 64 games by five points — combined — over perennial powerhouses Harvard and Wofford. That should be music to the ears of Oregon fans, whose path to the Elite Eight is now perhaps as open as any 8 seed nationwide. Oregon’s first test comes later today against Oklahoma State, which finished 7th in the Big-12 behind, among others, Iowa State (out), Baylor (gone) and Texas (doneski). OSU is no slouch, though; the team played in what was perhaps the best regular season conference, top to bottom, in the country this year, but it finished with a sub .500 record in the Big 12 and won fewer than 20 games total. The Cowboys’ 184th-ranked 23.5 defensive rebounds per game is sure to provide Oregon at least the opportunity to cash in on its gunslinging offense, and their fewer than 12 assists per game probably has elite shot blocker Jordan Bell licking his chops. Should the Ducks advance to the round of 32, they will run up against the curse of the 8/9 seed: a second round date with a #1 seed. Wisconsin, however, is probably the tournament’s weakest top seed. The Badgers have losses to Maryland and Rutgers, and close calls with Michigan, Georgetown and Michigan State. They score only 72 points per game and struggle when they can’t control tempo. 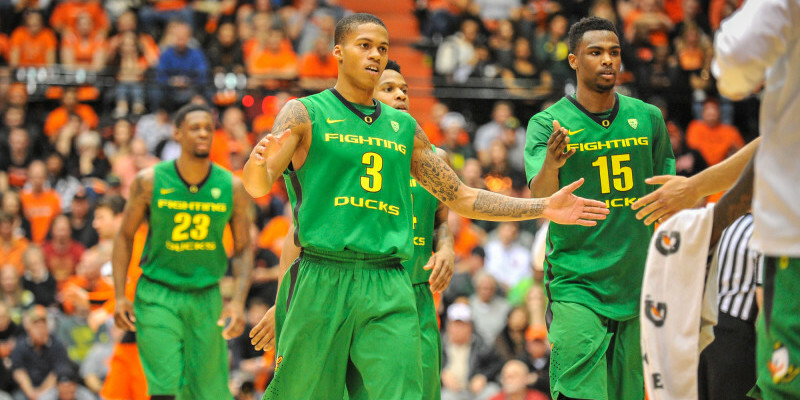 If Oregon is going to have a chance against any #1 seed, this is the one. Beyond Wisconsin are UNC and Arkansas, who each stumbled to victory yesterday by a single possession, and neither of whom scored 70 points, Oregon’s fast-paced offense gives the Ducks a chance against any and all of the above, and I, for one, am beginning to see a path.